Downloaded over 20,000 times since it launched! A hardcopy version is available on Amazon. 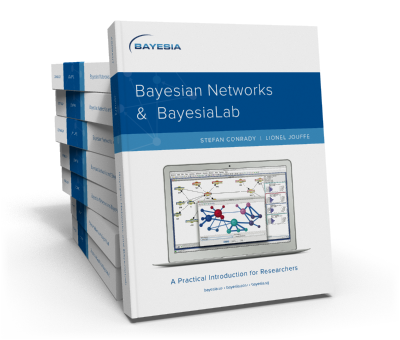 This practical introduction is geared towards scientists who wish to employ Bayesian networks for applied research using the BayesiaLab software platform. Through numerous examples, this book illustrates how implementing Bayesian networks involves concepts from many disciplines, including computer science, probability theory, information theory, machine learning, and statistics. Each chapter explores a real-world problem domain, exploring aspects of Bayesian networks and simultaneously introducing functions of BayesiaLab. The book can serve as a self-study guide for learners and as a reference manual for advanced practitioners. Please also note that we are currently working on an expanded, second edition of this book. You can check out our work in progress and download individual draft chapters here. Example: Where is My Bag?